Physical therapy is used with patients who have difficulty in moving around and perform everyday activities due to some injury or surgery. The major goal of this type of therapy is to reduce physical pain caused by any surgery and chronic health problems making daily activities easier. Physical therapies are professional in helping reduce such pain and make patients move around better, while improving their physical health and fitness level. Below we explore more facts about physical therapy including its functions and types. What Are the Functions of Physical Therapy? Physical therapy helps in recovering from a physical injury like back pain and plantar fasciitis by reducing pain in muscles, ligaments and tendons. If done correctly, under physician’s supervision, physical therapy can improve function and flexibility of soft tissues and help in developing muscle strength. Physical therapist might advise on how to perform certain physical activities in what specific manner, to reduce chances of any further injury. Patients with chronic or permanent physical condition can benefit from physical therapy. Physical therapy can help with conditions like vertigo, rheumatoid arthritis, spinal stenosis, Parkinson's disease, chronic obstructive pulmonary disease (COPD), temporomandibular condition and multiple sclerosis. Physical therapist will examine the patients thoroughly and develop a physical activity program to help with their specific condition, by strengthening muscles, increasing the range of motion or endurance. Some physical conditions like spinal cord injury, cardiopulmonary conditions, stroke, and brain injury entail numerous body systems and can cause a serious disability if not treated right away. Physical therapists’ job is to take care of the patient’s range of motion, physical mobility like walking around, climbing stairs, muscular strength, and endurance. They can recommend the proper equipment such as walker, wheel chair etc. according to the need of patients and help with the right use of it. Physical therapy is not limited to adults and it can help children with chronic health conditions and injuries by developing physical strength and endurance, hence improving mobility. The most frequently seen childhood injuries include cerebral palsy, muscular dystrophy, arthritis, and brain injury. Therapist inspects child’s condition thoroughly and then devises a physical plan according to his special developmental and physical needs. Some schools have physical therapy facilities for children with special needs, for example, children with scoliosis. Exercise is something extracurricular beside daily routine that improves strength and endurance. Physical therapy consists of an exercise that is expressly designed for particular injury or health condition. The exercise includes stretching of the muscles of back, abdomen and trunk, lifting weights, water aerobics, jogging, walking and several other physical activities. Cold or heat therapy is used to get an instant relief from inflammation and other muscle injuries. In cold therapy physician uses ice packs on injured parts of the body to relieve pain. Ice treatments include Ice massage, compression, elevation, cold packs, and lotions. Heat therapy relaxes muscles and heals the injuries by increasing blood circulation, which is widely useful in osteoarthritis with paraffin wax. Manual therapy includes treatment of the condition with the use of hands and not any other equipment. The goal of this kind of therapy is to reduce pain and induce relaxation. In a massage treatment, physical therapist relaxes muscles by applying pressure to the soft tissues that improves blood circulation. Mobilization treatment is used to pull, push or twist joints and bones into their particular position, using slow, calculated movements. This process helps with tight tissues, joints alignment and flexibility. Manipulation which is more aggressive than the others is used to place the bones and joints back in their position through vigorous movements. 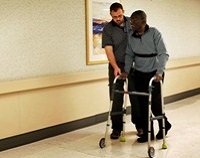 Physical therapy education and training includes performing daily activities without intricacy, how to use several equipment such as wheelchairs and crutches, avoiding injury and making home safe if the patient suffers from any serious strength or vision problem. Ultrasound therapy is used to help with muscle spasms; it relaxes muscles before exercise, using high-pitched sound waves. Ultrasound is not usually used for children Therapist should use greater caution while using Ultrasound to avoid deep heating. Electrical stimulation therapy is a treatment where electric current is used to create an effect in the body that treats a specific problem. This therapy is used for several purposes some of which are healing wounds and broken bones, after surgery healing like knee surgery, after a stroke and in other events to reduce pain. Specialized therapies include vestibular rehabilitation, wound care, oncology treatment, decongestive lymphatic drainage, and therapies for women which applied for urinary incontinence or to relieve pelvic pain. In hydrotherapy or water therapy, water is used to treat particular diseases, which includes water exercises. Besides, water has many beneficial properties in the form of steam and ice. What Can Be Expected from Physical Therapy? Physical therapy can be used with other treatments. Patients can get physical therapy in the nearest hospital, clinic, fitness center and home, with the help of health instructor and school. On the first visit, physical therapist will examine thoroughly and recommend therapy accordingly. 1. Physical therapists will examine the body’s functional activities along with how the body mechanisms work. They will work with patients on the goals for the therapy, and then make a treatment plan. In some conditions, patients can get treatment at the first visit. 2. First and foremost goal of the treatment is to reduce pain or swelling. The second step targets the flexibility, endurance and strength of the muscles according to the condition. Therapies are designed to help get through with daily activities without any trouble. After therapy patients might experience swelling or soreness, but therapist will note these after treatment reactions and treat accordingly. 3. Physical therapist will guide patients about specific equipment, some home exercise program that enable them to carry out on their own. He/she will monitor the progress and check how good the learned skills is used in the daily life. Such monitoring will continue until the therapist and his patient reach the goal.